Bull Riding is a sport that can trace its roots back to ancient times with contests to tame bulls going back to the classical age with the Minoans being particular fans of this type of activity. However, the modern version of the sport has its direct roots from Mexican contests of ranching and horse skills that began to be developed in the 16th and 17th centuries. These activities, given the collective name of charreada, became popular in Texas and California during the 19th Century and grew into the popular sport that exists today. The popularity of bull riding in today’s world can be traced back particularly to the establishment of the Professional Rodeo Cowboys Association in 1936, which now has the PRCA Pro Rodeo and Xtreme Bulls brands that are hugely popular. Bull riding is a popular TV sport in the USA and in countries and around the world and more and more nations are beginning to host their own competitions. 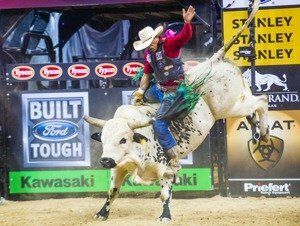 That means, as well as the traditional bull riding countries such as the USA and Mexico, you can find competition in countries, such as Canada, Australia, New Zealand, Brazil, Argentina, Nicaragua, Guatemala, Honduras, Costa Rica, and Panama, all competing under the rules of the Professional Bull Riders organisation. The object of bull riding is for a rider to mount the bull and then once the bull is let out into the arena, to stay on the bull for at least eight seconds as the bull spins, kicks and twists attempting to throw them off. The rider is only allowed to hold on with their riding hand, which makes it very difficult for the rider and very exciting for the spectators watching. Each ride consists of a bull and a rider. On the surface, it may seem that bull riding is a sport that requires very little equipment, but on closer inspection there are several key pieces of kit that are essential for performance and safety. The bull rope: This is what the rider holds onto whilst riding the bull. Made of braided rope or another substance, it is adjustable depending upon the size of the bull and is how the rider attempts to control the bull and hold on. Gloves: Because rope can burn hands in the extremely frenetic sport of bull riding, each rider wears leather gloves to prevent this and they can also provide an extra sense of grip too. Boots: Cowboy boots are essential, as their spurs can help keep the rider balanced whilst on the bull and they can also use them to ‘spur’ the bull into action in an attempt to score more style points from the judges. Chaps: These are worn on the legs and provide protection and prevent chaffing whilst being thrown about on the bull. Helmets: Helmets are not required at most adult level competitions but are required at junior level rodeos. However, more and more riders are beginning to wear them. Scoring in bull riding is relatively straightforward and occurs once a rider has remained on the bull for more than eight seconds. Each ride is scored out of 100 with two judges each scoring the bull out of fifty and the rider out of 50. These scores are then added together and then averaged between the judges resulting in the final score for a ride. Judges score several aspects of both the bull and the rider. Judges look at how hard a time the bull gives the rider, the harder the ride, more points are awarded. Generally, the more power, speed and agility that the bulls display that will also result in more points. When judging the rider, judges look at how much control they display during the ride, as well as the rhythm that they exhibit in harmony with the bull. Riders generally compete over several rounds, and these may last several nights, each rider having one ride per night. Experienced riders can regularly score over 75, some may have the occasional ride over 80, and there may even the odd exceptional rider that scores a 90 or over. On the final night, the scores are all added up and the top 20 riders are all given one more ride. This final round is known in rodeos as the ‘short-go’ and the rider who has the most points following this is declared the overall winner. Rodeo competitions usually take place over a number of nights with each rider riding a different bull each night, matched in a random fashion. Each bull that is to be used must be chosen to show the characteristics of strength, agility, and health. The rider mounts the bull in a small enclosure known as a bucking chute where the bull is held steady where they can get a good grip and ready themselves for the start of the ride. Once the rider has indicated they are ready and have a good grip of the bull rope, the bucking chute is opened and the bull rushes out into the arena, being ridden by the rider. The rider must attempt to stay on the bull as it bucks, spins and twists to try and dismount them. By staying on for more than eight seconds, the rider can then be given a score by the judges. Failure to stay on the bull for at least eight seconds means the ride goes un-scored. Throughout the ride, rodeo clowns stay close to aid the rider if they are thrown off the bull. They do this by distracting the bull, ensuring that they don’t injure the rider whilst on the floor and enable the riders to leave the arena safely. Riders usually ride on bull per night on a multiple night rodeo with the top 20 scoring riders on the final night having one last ride. The rider with the highest collective score after this final round is declared the winner.